That looks very much to be the maroon coupe that Gerd Hermann owned here in Western New York. Does anyone know if the family still has it? 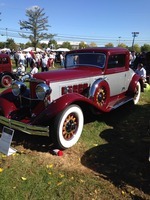 Bill Eaton's original 8-35 coupe looks amazingly well preserved. That is one gorgeous car!! Keith from this past weekend. 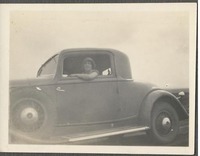 Period pictures of a coupe. Hey folks, Sorry I haven't been on here in quite a bit,, Summertime is very busy for me, business and to much grass to cut !! patient. March 2017 will get here eventually !! she was in. It truly hurt me to look at the car like it was, knowing how awesome it could be, so I had to do it !! Hope that makes sense folks..
Bill, I am sure it will be stunning, and at the same time fulfill your dream since childhood, so, congratulations! March 2017 is just a few months away. Bill, I understand the dilemma. Also, pictures tend to lie. Just about everything looks better in a picture than when you are standing 3 feet away. 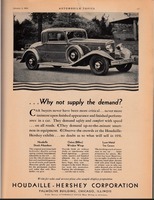 I basically had the same choice with my Graham Convertible coupe. It looks ok in pictures but not so great standing in front of it. I showed it once at St John's since they were having a special class for Hollywoods and asked but otherwise it doesn't run or drive so it is a pain in the rear end bringing it anywhere. Btw, here is a video my son took when we dragged it on the field. 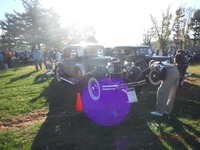 Towards the end you can start to see the new Bentley's and Rolls Royces, quite a juxtaposition to what I was showing. Bill, I certainly was not being critical, just making a statement based on photos you shared with me of the car taken just before the restoration began. I guess I thought it was in better shape than it actually was. March 2017 is only about a year and a half away and who knows maybe your shop will get a shot in the arm and get it ready sooner than expected so you can bring it to the REO meet next year in Ohio where we are trying to put together a ROYALE Reunion. That would be a real treat for all of us to be part of the car's debut. 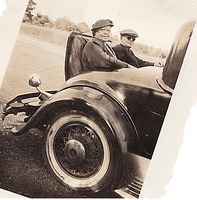 A couple in the rumble seat.